"A culture of impunity in the region has existed for too long. The lack of accountability ... has reached a crisis point; ... Time and again, experience has taught us that overlooking justice only leads to increased conflict ..."
On the first annual commemoration of Israel's Operation Cast Lead, Ma'an presents a three-week series recounting the findings of South African jurist Richard Goldstone's UN Fact Finding Mission on the Gaza Conflict, updated daily and in context. During the first four minutes of Israel's devastating winter assault on the Gaza Strip, launched 27 December 2008, over 60 warplanes struck 50 targets, ultimately killing and injuring hundreds by midnight. Gaza's World Health Organization chief recounts the day's events from a medical perspective, and as a father. Israeli forces shot dead three unarmed protesters on 28 December 2008, day two of Operation Cast Lead. "There was a significant increase in the use of force by Israeli security forces during demonstrations in the West Bank after the start of the Israeli operations in Gaza," according to Goldstone's final report. Grad rockets killed two Israelis near the Gaza border on 29 December 2008. Goldstone offers a damning indictment of Palestinian projectile fire: "... they constitute a deliberate attack against a civilian population. These acts would constitute war crimes and may amount to crimes against humanity." On 30 December 2008, hundreds of locally-based journalists petitioned the Israeli High Court over the army's press ban. "[T]he world's media is unable to accurately report on events inside Gaza at this critical time ... Despite our protests, the Israeli authorities have refused to let journalists in ..."
Israel's army leveled the Palestinian parliament building on 31 December 2008, an act the Goldstone report rejects as unlawful, as attacks "that are not directed against military objectives are violations of the laws of war, no matter how promising the attacker considers them from a strategic or political point of view." Day 6: Gaza police - legitimate targets or targeted civilians? Among 70 targets hit on 1 January 2009 was a police command center in Rafah. No one was hurt in that airstrike, but 248 members of the Gaza police were killed during Israel's overall assault. By late January 2009, more than one out of every six casualties was a member of the de facto government's security forces. As Israel's operation entered its seventh day on 2 January 2009, an AP photographer covering a march in support of the people of Gaza was assaulted by members of the Palestinian Military Intelligence, an attack similar to other incidents in which PA forces violently repressed dissent across the West Bank. At least 15 people were killed and around 40 injured – many seriously – when Israeli forces struck the Al-Maqadmah Mosque northwest of Gaza's Jabaliya refugee camp with a missile on 3 January 2009. "We screamed and we called for God. We said, 'Please help us. Help us God. Help us God. Help us God. ...'"
On 4 January 2009, Iyad Samouni, already handcuffed, was shot in the leg in view of his father, wife and children, who were all prevented from coming to his aid despite emotional pleas. "Israeli armed forces ensured that he did not receive lifesaving medical help. They deliberately let him bleed to death." Goldstone investigated 11 incidents in which serious allegations of direct attacks with lethal outcome were made against civilians, the most deadly of which occurred on 5 January 2009. "There appears to have been no justifiable military objective pursued in any of them," his report concluded. Day 11: Did Israel whitewash a massacre in Jabaliya? Israeli forces fired at least four mortar bombs near an UNRWA elementary school on 6 January 2009, killing as many as 43 innocent civilians. Finding evidence of weapons misuse, Goldstone's report also alleges a coordinated but poorly executed cover-up on the part of the Israeli military and its defenders. Israeli forces declared a three-hour humanitarian ceasefire on 7 January 2009. "So really I was amazed at how could a soldier be firing at my daughter?" a father would later recount to Goldstone and his team. "They [started] shooting at the children with no reason, with no explanation, no pretext." On 8 January 2009, Israeli artillery shells struck the apartment of Dr Jaber Abu An-Naja. His wife was cut in half by the explosion and his son-in-law was thrown from the balcony on to the street below. The shelling was just one of dozens nearby that destroyed parts of the Al-Quds Hospital in Gaza City. When the Al-Bader flour mill was destroyed on 9 January, the strike happened without prior warning, raising questions about the efficacy or seriousness of the warnings system used by Israeli forces during their operation, which allegedly included "attacks on the foundations of civilian life in Gaza." To justify the death toll in its winter assault on Gaza, Israel's military has alleged that Hamas used the local population as human shields, a war crime. Goldstone's inquiry examined cases, including one on 10 January 2009, in which Palestinian civilians were indeed used as human shields – by Israeli forces. Egyptian media reported on 11 January 2009 that Israeli soldier Gilad Shalit was wounded in an airstrike, leading to a flurry of outbursts by Hamas and Israel. The Goldstone report concluded that Shalit meets the requirements for prisoner-of-war status, and is thus entitled to external communication and other rights. On 12 January, nine Palestinians were blindfolded, handcuffed and transported to the Erez border, where they "were told to run into Gaza, to look straight ahead and not to look back." Freed detainees recount an experience "of abandonment, desperation, suffocation and isolation." Israel’s Foreign Minister, Tzipi Livni, said on 13 January 2009: "We have proven to Hamas that we have changed the equation. Israel is not a country upon which you fire missiles and it does not respond. It is a country that when you fire on its citizens it responds by going wild – and this is a good thing." Part eight of a series recounting the findings of South African jurist Richard Goldstone's UN Fact Finding Mission on the Gaza Conflict. At least 15 people were killed and around 40 injured – many seriously – when Israeli forces struck the Al-Maqadmah Mosque northwest of Gaza's Jabaliya refugee camp with a missile on 3 January 2008. "On the day of the event I went to the mosque to pray the evening prayer," said Moussa Al-Silawi, 91, the mosque's sheikh, during testimony to Richard Goldstone's UN fact-finding mission. "If we hear any aircraft, any bullets, if we hear anything, usually we run to the mosque to take refuge." our children to the mosque, because we believed – and you know very well that when you are fearful, any person, when you are scared, you should go to the church, because the church is a safe place. There is no safer place than a church. "We therefore went to the mosque and sent our people to the mosque. ... As soon as the imam finished the prayer, then I stood up to preach to the people, to give a lesson, to talk about peacefulness. "And after two words, there was a loud explosion in the mosque. Everybody was looking toward the qiblah, toward Mecca. I was the only one who was looking toward the door. And there I saw fragments like rain falling at the door of the mosque. At that moment we were all very, very fearful. Everybody was screaming, everybody was yelling: men, women, children." "We screamed and we called for God. We called for God, we said, 'Please help us. Help us God. Help us God. Help us God,'" he said. Al-Silawi added: "It was a terrible, terrible shock. I cannot describe to you what I saw: a safe place, and people go to the mosque for safety, and we saw bloodshed. There was blood in the mosque. I saw legs and arms. I saw the leg of a small child, and I stepped on it, even. ... We saw legs, arms, blood. I swear to you that I saw this with my own eyes. "How can I describe it to you? I – with my own foot – I stepped on the head of a small child. Where is the world? Where is international law? Is this what the Palestinian people deserve, our children screaming?" The Goldstone team established that the Israeli army fired a missile that struck near the doorway of the mosque. "The penetration pattern witnessed on the concrete ramp and stairs underneath is consistent with that which would be expected of a shrapnel fragmentation sleeve fitted onto an air-to-ground missile. Shrapnel cubes that the Mission retrieved from the rear inside wall of the mosque are consistent with what would be expected to be discharged by a missile of this nature." While the final report did not determine with certainty which kind of aircraft or air-launch platform fired the missile, it "believes the testimony of the witnesses regarding the circumstances of the attack, finding it plausible and consistent not only with the other witnesses, but also with the physical evidence at the scene." Another witness, Sabah Al-Salawi, lost five children in the attack. "After I heard the hammering of the rocket, I found people carrying bodies, and killed and wounded people in the ambulances. Then I rushed to the morgue and I saw the drawers of the morgue. I saw them. "So how could you imagine my condition?" she added. "If we don't find protection in the house of God, where do we find protection? I demand all the people, Arabs and Jews, to avenge the martyrdom of my children and young children." Goldstone's team heard five eyewitnesses who had been in the mosque at the time it was struck. They also heard from a number of relatives of those who died in the attack and has seen a number of sworn statements signed by them testifying to the facts they witnessed. Additionally, the team interviewed the mosque's sheikh on three occasions, its imam twice, its muezzin, several members of the sheikh’s family, several of those injured in the blast and a number of the relatives who lost family members and who assisted in the immediate aftermath of the attack. It has seen medical certificates that bear out the nature of those injuries related by the young men it interviewed. "A dog could die. A dog would die in one of the European countries or in Israel and there is upheaval because of the dog, but we see sheikhs dying, their body parts scattered around in a place of worship, and nobody looks at them. Where is justice?" he said. "I am 91 years old. I was born in 1917. I lived at the time of the Turks, the time of the British, but we never saw anything of this sort. We've never seen something like that. ... I have never seen such a catastrophe. "And what can I say? What can I say except that this is the will of God. Whoever hears my voice, whoever can see me, he has to say 'amen.' May he say that may God protect us, may God forgive us, may he punish our enemies, may God punish these enemies and may he punish also all the Arabs that have allowed this to happen," he told the commission. According to the Goldstone report, commission members observed that the interior walls of the mosque and part of the exterior wall around the doorway appeared to have suffered significant damage as a result of a spray of small metal cubes. A good number of these were lodged in the wall even at the time of the visit to the site in June 2009. Several of these were retrieved and the commission could see how deeply embedded they were in the concrete walls, the report states. One of the two wooden doors was blown off its hinges, landing across the prayer area at the opposite wall. There has been no suggestion that the mosque was being used at that time to launch projectiles, store weapons or shelter combatants. "Since it does not appear from the testimonies of the incident or the inspection of the site that any other damage was done in the area at that time, the Mission concludes that what occurred was an isolated strike and not in connection with an ongoing battle or exchange of fire." In response, Israel's army stated, without elaborating: "… relating to a strike against the 'Maqadme' mosque in Beit-Lahiya on January 3rd, 2009, it was discovered that as opposed to the claims, the mosque was not attacked at all. Furthermore, it was found that the supposed uninvolved civilians who were the casualties of the attack were in fact Hamas operatives killed while fighting against the IDF." Al-Silawi rejected the notion that there was armed activity anywhere in the vicinity. "I challenge the State of Israel to prove that we had any kind of military operations or any military indication around the mosque," he said. "The neighborhood in which we live is a very safe neighborhood. There was relative calm. Our neighborhood is peaceful." He added, "And I wonder, is there in the Israeli law a provision that says you cannot go to a mosque in time of war? Are people prohibited from reaching a place of worship? Is there such a provision, such a law in Israel, or a law that would prohibit me from going to church? If so, then we will not go to places of worship." The Goldstone report reinforces the sheikh's account, noting that as far as Israel's explanation is concerned, "Apart from the apparent contradictions it contains, the Mission notes that the statement does not indicate in any way the nature of the inquiry, the source of its information or the reliability and credibility of such sources. "In the absence of any explanation as to the circumstances that led to the missile strike on al-Maqadmah mosque and taking into account the credible and reliable accounts the Mission heard from multiple witnesses, as well as the matters it could review for itself by visiting the site, the Mission concludes that the mosque was intentionally targeted by the Israeli armed forces. The Mission also takes into account the precision and sophistication of the Israeli armed forces' munitions in making this finding. "The Mission's finding is strengthened in the face of the unsatisfactory and demonstrably false position of the Israeli Government," the Goldstone report states. "It follows that this was an attack on the civilian population as such and not on a military objective." Part seven of a series recounting the findings of South African jurist Richard Goldstone's UN Fact Finding Mission on the Gaza Conflict. As Israel's assault on Gaza entered its seventh day on 2 January 2009, an Associated Press photographer covering a march in Ramallah in support of the people of the Strip was attacked by members of the Palestinian Authority Military Intelligence. The photographer said a security official in civilian clothing first shouted at him to stop taking pictures and then he was assaulted by two security agents and taken by force to a nearby building, where he was beaten until he lost consciousness. He was taken initially to the intelligence headquarters but then transferred to a hospital, where he was treated for a broken nose and subsequently released. The Palestinian Center for Development and Media Freedoms (MADA), a local journalists' association, began reporting a gradually worsening situation for freedom of the press in the West Bank within the past year. Allegations of violations of press freedom by the PA included reports of arrests of journalists, the closure of media offices, the forcible changing of newspaper and news website headlines, attacks against photographers, some of whom were forced to delete material, and breaking or confiscating photographic equipment. 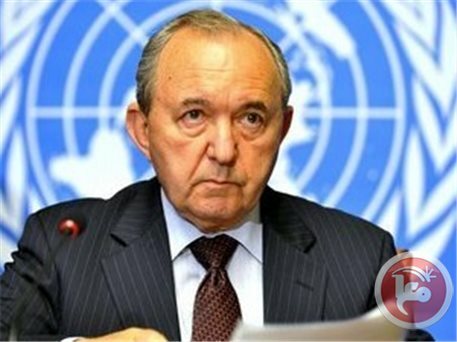 Richard Goldstone's UN fact-finding mission received several reports of direct or indirect interference in media coverage of demonstrations in the West Bank during the Israeli military operations in Gaza. The team was informed, for example, that the PA censored television programs and newspapers, and that editors were at times informed verbally not to use certain terms or words, or not to broadcast programs that could be considered as incitement against the PA. The PA's interference with the work of journalists and the media gave rise to the concern that the right to freedom of opinion and expression was interfered with during the military operation, either for Israel's benefit or to stigmatize Hamas, the main political rival of the Fatah-administrated government in Ramallah and the Israeli army's chief military enemy, which the latter considers a terrorist organization. The UN mission did not say one way or another if PA's crackdowns on the press likely violated international law during the assault, but noted that its members were "concerned about interference with the freedom of the media" throughout the operations. Elsewhere in the report, however, the Goldstone team says the PA's role in stifling dissent could constitute violations of international law. According to article 19 of the Universal Declaration of Human Rights, the right of freedom of expression "includes freedom to hold opinions without interference and to seek, receive and impart information and ideas through any media and regardless of frontiers," the mission noted in its final report on the Gaza conflict. But in areas controlled by the PA, particularly Hebron, journalists were assaulted and detained routinely. For instance, on 18 January 2009, a well-known West Bank journalist was reportedly detained overnight at Preventive Security headquarters in Hebron and questioned about an interview he had given to the Al-Quds Satellite Channel in which he was critical of the PA. According to his affidavit, he was then brought before the director of the Preventive Security in Hebron, who he said encouraged him to exercise self-censorship. But the harassment didn't stop when Israel and Hamas declared unilateral ceasefires on 23 January 2008. Beginning the next day, for example, between 24 and 27 January 2009, four correspondents of Al-Quds were arrested by the Preventive Security Service, the Palestinian General Intelligence and the Palestinian Military Intelligence, and interrogated about their work. On 22 April 2009, the Palestinian Centre for Human Rights (PCHR) noted the arrest by the police in Nablus of a professor of political science at An-Najah University in Nablus who had expressed support for Hamas on a program of the Al-Aqsa television channel when asked to comment on the recent attack against members of the Palestinian Legislative Council by Israeli forces. On 16 July 2009, caretaker Prime Minister Salam Fayyad issued a decision to close the Qatari network Al-Jazeera's offices in the West Bank, because it broadcast an interview with a senior Fatah leader, who accused senior PA officials of being implicated in the death of former President Arafat. Although the ban was lifted on 18 July, Fayyad announced that he would pursue legal action against the channel "for its continuous incitement against the Palestinian National Authority." Goldstone's team received information from various sources that demonstrations in support of Gaza were both prevented from taking place and, in some cases, violently repressed. 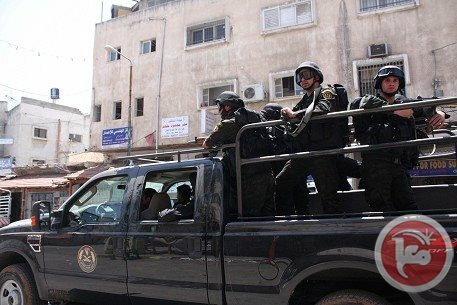 Security officers reportedly used excessive force during demonstrations on 2 January in Hebron and Ramallah. At both events, protestors suffered injuries after being beaten. Journalists at the Hebron protest were prevented from reporting on the event. The rights group Al-Haq said a student demonstration at Birzeit on 5 January 2009, which had the stated aim of "showing the occupation forces that Palestinian students reject all aggression against Gaza," saw a heavy deployment of Palestinian Preventive Security, General Intelligence and Military Intelligence services personnel. Many students were reportedly beaten; 50 were injured, 9 of whom were hospitalized. Many were also detained, although most were released later the same day. Khalida Jarrar, a member of the Palestinian Legislative Council, said she had received a call from one of the students asking her to come to the hospital and witness the injuries. According to Al-Haq, on 26 January, after the end of the Israeli military operations in Gaza, a peaceful sit-in was held near the security forces' headquarters in Hebron against detentions on political grounds. Reportedly, "security forces beat demonstrators, including children, with sticks. Although several demonstrators were injured, security forces impeded access of medical personnel." The affidavit of one eyewitness states that "Palestinian security officers demanded that we disperse and take our banners down. As demonstrators refused to disband, a group of female security officers started beating them with sticks. The security officers addressed the demonstrators, saying: 'You are Shiite. In Gaza, you shot the legs of Fatah activists. You stole food supplies in Gaza.' Security officers also impeded access to a Palestinian ambulance and prevented medics from evacuating eight injured protestors." In another serious incident, a former student leader who used to be a well-known political activist informed the Goldstone team that he was tortured by the PA's security forces, apparently because of his protest activities. During the operation in Gaza, he took part in daily protests and was stopped several times by PA security services. He reported that on 2 January 2009, after the Friday midday prayers, he was stopped by security personnel in plain clothes and in uniform in the center of Ramallah. He was pushed into a car carrying the emblem of the PA, where electrical shocks were applied to his body. He was then taken to the Military Intelligence office and interrogated. He alleges that a high-ranking Military Intelligence official threatened him with six months' arrest under the emergency law and warned him not to criticize the PA and to refrain from talking about the resistance, Hamas and Gaza. The PA, inasmuch as it exercises control over the territory and people, has an obligation to respect and enforce the protection of human rights, the Goldstone report states, noting that both international and domestic law prohibits violations. "The Palestinian National Authority shall work without delay to join regional and international declarations and covenants which protect human rights," according to its de facto constitution, the Palestinian Basic Law, which broadly encompasses the rights enshrined in the Universal Declaration of Human Rights. The Goldstone report notes that the PA has likely carried out arbitrary and unlawful arrests and detentions of political opponents in the West Bank, and regularly denied political detainees access to legal representation and basic due process rights, including the right to be brought promptly before a court and charged with a recognizable criminal offence, contrary to the norms contained in the Universal Declaration. "From the information available to it, the Mission finds that there are features of the repressive measures against actual or perceived Hamas affiliates and supporters in the West Bank that would constitute violations of international law," the Goldstone report concludes. "Furthermore, in efforts to minimize the power and influence of Hamas, the protection and the promotion of human rights have generally been eroded." "The Mission is concerned that, by failing to take action to put an end to the practices described above, the Palestinian executive and judicial authorities are contributing to the further deterioration of the fundamental rights and freedoms of Palestinians, the rule of law and the independence of the judiciary. "It appears from the information the Mission received that the Palestinian Authority's actions against political opponents in the West Bank started in January 2006, intensified between 27 December 2008 and 18 January 2009, and is continuing until today. "The Mission considers detentions on political grounds legally unacceptable for several reasons: the arrest and indefinite detention (without trial) by security services and under the military judiciary system are in violation of Palestinian law and international human rights law; and the arrests and detentions are apparently based on political affiliation, which would violate the right not to be arbitrarily detained, the right to a fair trial, and the right not to be discriminated against on the basis of one’s political opinion, which are both part of customary international law. "Moreover, the reports of torture and other forms of ill-treatment during arrest and detention, and the reports of deaths in detention raise further concerns and warrant proper investigation and accountability." The report states that it is "a serious concern to the Mission that the normal system of checks and balances between the executive, the legislative and the judiciary branches in the area controlled by the Palestinian Authority appears to be flawed. There seems to be little evidence of a functioning accountability system to counter instances of torture and other forms of abuse of power. "It is also of serious [concern] that, in the absence of governmental oversight, civil society organizations are receiving threats and being harassed and seeing their operations impeded by administrative obstacles."